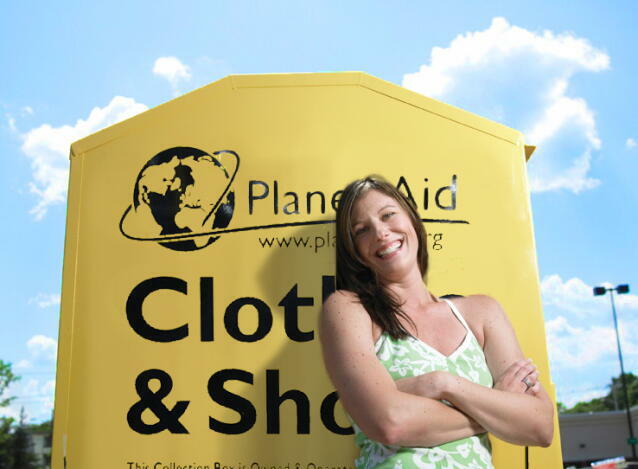 Our Convenient Yellow Bins - Planet Aid, Inc.
We are proud that our signature yellow boxes and bins have become a hallmark for clothes recycling in the United States. There are about 19,000 of them in our 19-state coverage area, both in outdoor and indoor locations. The reason we make our bins so convenient is that research has shown that people are reluctant to go out of their way to recycle. If we are to increase textile recycling rates (which are very low), the path from closet to recycling bin must be as easy and short as possible. Our bins are waterproof, securely locked, and insured so that donors and site hosts can confidently utilize them. They are serviced frequently so that the surrounding area is kept clean and there is always room for new donations. You can find one near you using our bin finder: planetaid.org/find-a-bin. If you want to donate or recycle your clothes with us, but there is no bin in your area yet, you can ship your items to your nearest Planet Aid location. See our Local Pages for the address nearest you. You can also click here to request a bin in your area!